Achiltibuie isn't somewhere you get to by accident. To get here takes a positive decision and rather more effort than is usual in a world ruled by the motor car. There are two routes in, and each involves around 10-15 miles of fairly hilly and twisting single track road with short sight lines that really keep you on your toes. One approach branches off the main A835 about five miles north of Ullapool and follows a tortuous route along the north side of Loch Lurgann, and under the foot of Stac Pollaidh (a short climb for the energetic, though achieving the very highest few feet is rather more challenging). 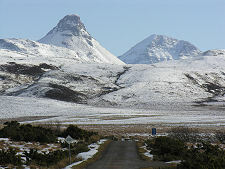 Then, having run most of the length of the Coigach Peninsula, it turns back on itself at a junction near Achnahaird. It then heads south east before meeting the sea at Badentarbat Bay overlooking the Summer Isles and taking you back down the coast to Achiltibuie and beyond. The second route brings you in a generally southerly direction from Lochinver, and treats you to a range of lesser-seen views of Scotland's best mountain, Suilven. It joins the road from Ullapool at the western end of Loch Bad a'Ghaill and treats you again to the trip to Badentarbat Bay and back down the coast to Achiltibuie. 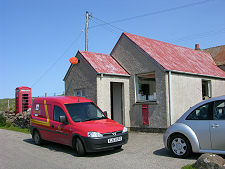 Achiltibuie itself comprises two miles or more of sparsely strung out habitation on a hillside above the coast, plus a shop, a post office, and a youth hostel. There is also a reasonable selection of other accommodation in the village including the Summer Isles Hotel and various B&B establishments. 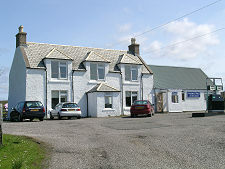 The Summer Isles Hotel is renowned for its fine dining, and the Summer Isles Bar which forms part of it offers less formal dining and a friendly welcome. What this straggling community lacks in town planning, it more than makes up in its absolutely stunning views to the south west across the wonderfully named Summer Isles. When the weather is fine, there can be few finer places to pass your time, and few finer seascapes. 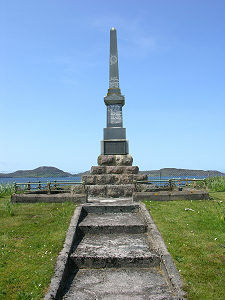 The Summer Isles, comprising Tanera Mor, Tanera Beag and a couple of dozen smaller islands, are no longer permanently inhabited, though 119 people lived on Tanera Mor in 1881. 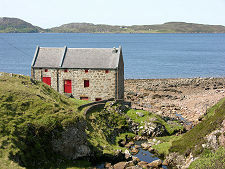 Some of the islands can, however, be accessed, either from the pier at the north western end of Achiltibuie or from Ullapool. 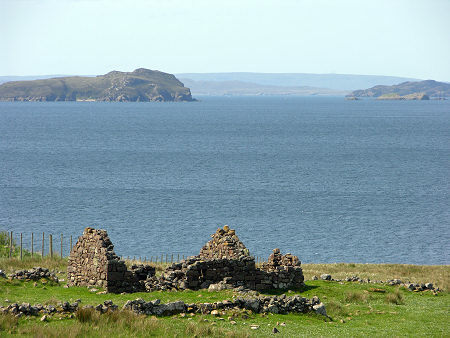 Achiltibuie used to be home to the Hydroponicum. 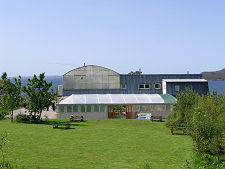 This soil-free complex of glasshouses was closed when we last visited the village, but to an extent has been replaced by the Achiltibuie Garden. 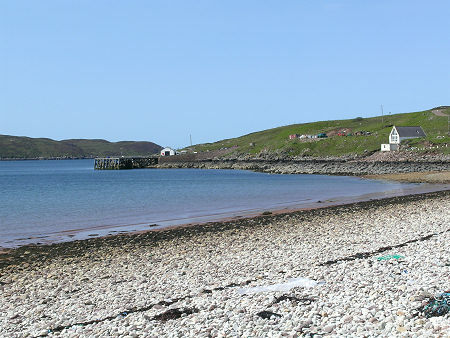 Achiltibuie's north west end overlooks Badentarbat Bay, with its broad beach of white shingle. 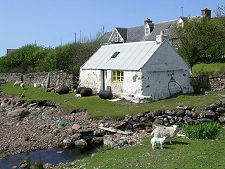 On the shore here, near the Coigach Free Church, is a water powered corn mill dating back to the 1800s. Achiltibuie is just the best known of a number of small settlements around the coast of western end of the Coigach Peninsula. 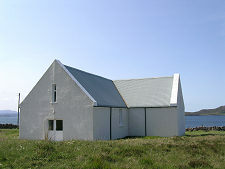 Following the road north west past Badentarbat brings you to Polbain and Altandhu, complete with Coigach's main harbour at Old Dornie, in the sheltered passage between the peninsula and Isle Ristol. Further on, a side road takes you to the scattered settlement of Reiff, while the main road crosses the peninsula to Achnahaird and its beach. Achiltibuie and the Coigach Peninsula are not for those who like their Scotland neatly packaged in shops selling tartan dolls waving Saltires. This is the north west of Scotland as it used to be twenty or thirty years ago, before they blasted new roads out of bare rock and painted white lines down the middle of them. Yes, you have to make an effort to get here. But you should try to catch it while you can.